We offer you the best of both worlds with our convenient Hire service. Grab the camping experience you’ve always wanted without the camping hassles you’ve always dreaded. 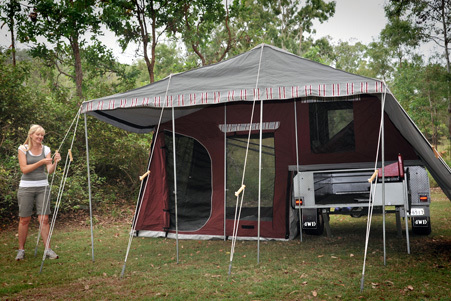 Our camper trailers enable you to experience the great outdoors in style and comfort without breaking the budget. If you’re new to camper trailers and don’t know which one is the right model for you, hiring a Camper Trailer means you can check out both On and Off Road models, take them away for a short break and really get a feel for the comfort and easy handling. Whether you want a weekend getaway or some serious time-out, our camper trailers offer a choice of quality Light Off Road or Off Road camper trailers for hire, fully equipped and ready to hit the road. All you need to bring is bed linen and cutlery to suit your own personal requirements – or if it makes life easier, you can hire those items from us as well! We’ve lost count of the number of happy hire customers who’ve come back and decided they want to make one of our campers their own. And making the move from hiring to buying is so easy, particularly with our finance options. The Cub Explorer Hard Floor Camper Trailer can be towed behind most vehicles and will go anywhere that your vehicle will go. Quick set up and is best suited for couples. 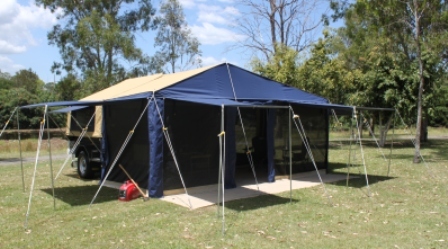 Comes with full length awning for extra shade. *Minimum Hire Rates do apply. Prices are in Australian Dollars (AUD) and include GST. Prices subject to change without notice. Photos are for illustrative purposes only. When you pick up your hire Camper Trailer, our experienced staff step you through the process and demonstrate exactly how it is packed-up, set-up, hooked up, as well as how everything works. We also provide you with a basic guide just in case you need a little help when you get out there. With so many beautiful destinations to choose from and such an affordable, simple and easy camping solution, why delay your dream outdoor experience any longer? Allow yourself plenty of time to pack – especially if you’re heading off the beaten track away from all mod cons. If possible have a trial run, setting it up and connecting everything – you’ll be surprised how much easier and quicker it becomes after a few attempts. Book as soon as possible – once you’ve decided which model you’d like to try and when you want to explore.